I have wanted to make these brownies for quite some time and finally did it. A boxed brownie mix has been waiting patiently in my pantry closet for me to transform it into the rich decadent and fattening dessert it was meant to be. Little did it know I had other plans. It is always a challenge for me to make delcious and luscious desserts without all the fat and guilt. It’s easy to make recipes low-fat, but the end result is not always very good. My goal for these brownies was to get all the fudgy full fat flavor along with a dence, moist and chewy texture. Mission accomplished! I have a secret ingredient. And, no it’s not applesauce. Use the ingredients on the box*, except replace the oil with prune puree. Follow the instructions on the box and then spread the batter into the prepared baking pan. 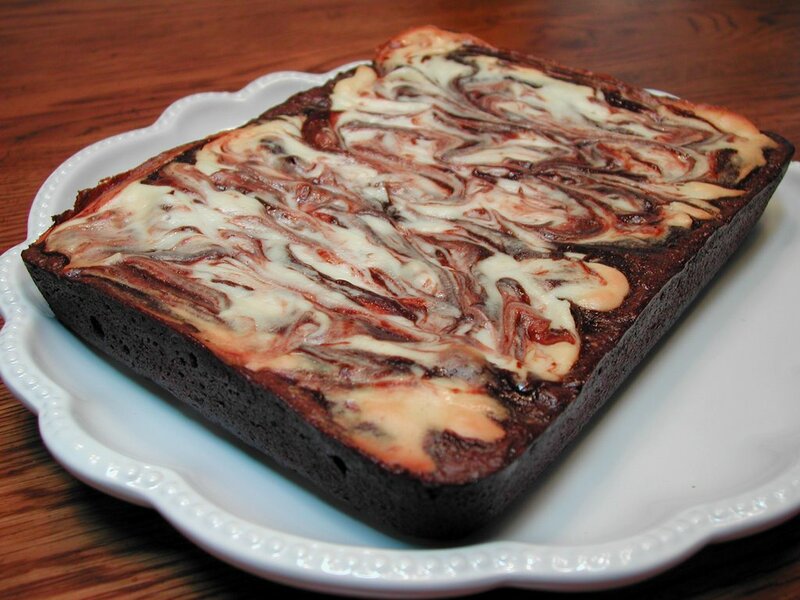 Drop the cream cheese mixture by spoonfuls over the brownie batter and swirl with a knife to marbleize. Bake as directed on box, increasing the baking time by an additional 5 minutes. To make a 1/2 cup of prune puree, add about 12 prunes and 3 tablespoons of warm water to a food processor. Process until only tiny bits of prune remain. Add a little more water if necessary. Beat 1/2 Package of softened regular cream cheese*, 1 egg white, 2 T flour, 5 1/2 T sugar and 1/4 teaspoon pure vanilla until well blended. *To make these brownies even lower fat, (if your brownie mix advises to use 2 eggs), you could use 2 egg whites and 4 teaspoons of canola oil to replace the egg yolks. In addition, you could use low-fat cream cheese. I would’nt recommend fat-free though, it will change the flavor and texture. As I mentioned earlier, I have wanted to make these brownies for a while. I actually forgot about them until I recently posted my Italian Prune Cookies. I received a comment from Eprof2 that his wife makes a Chocolate Chip Prune Cookie; his favorite. He was nice enough to give me the recipe and as I was reading it, I remembered the brownies I wanted to make. Both recipes use prune puree in place of the fat. All I can say is you have to try it. You might not want to tell anyone your secret though, because as we all know prunes have a bad rap. I am on a mission to change this sad reality. In fact, it was Eprof2 that reminded me that even the prune companies are trying to change this by re-naming prunes...Dried Plums. Very clever. In fact, I will from this point forward refer to them as such! Do you like Dried Plums? I can't say that I've ever just eaten prunes for the fun of it. I do like dried cranberries, does that count? :-) I may have to try that substitute. I've done the applesauce sub and have found that sometimes it works without any detriment to the taste of the dish and other times it just doesn't work at all. One brownie mix that I've found applesauce has NO detriment on is Ghirrideli (SP?). It is just as fudgy and delicious as ever! BTW, now that you mention it, the chicken chili is a tad salty. So, I think if you rinsed the beans it would not harm the dish, only let the herb mixture stand out more! Let me know if you try it this way and how it turns out. Yes, I love prunes. It's a shame they get a bad rap. They're no different than any other dried fruit. I grew up eating lekvar (prune)-filled cookies and breads around the holidays so I've never been anti-prune. Prunes, eh? I'd so be thinking raspberries!! and I hate prunes... imagine that! to believe it but it's true!!! 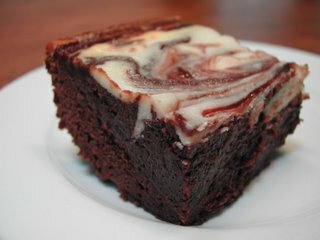 Ohmygosh, I've totally used the prune puree in brownies before and I forgot about it! It turned out pretty good although I'm sure it would have been better if I used cream cheese like you did (good idea). Yes, I like dried plums - they are very good. Figured out how to link, so...now you're linked on my site! Claire, I think you'll love the "dried plum" substitute, even the staunchest critics could'nt really detect it in the brownies. I will have to try the Chicken Chili, but I will have to omit the chili powder because I can't eat spicy foods. I don't know if it would be defeating the purpose of "chili". Paula, I don't know if I have ever had those cookies, but I do know that I'd love em. Jen, I agree the one bowl are the best, but I never said the box mix would even come close. The applesauce does work but I have to say the "Dried Plum Puree" gives the brownies a fudgier texture. I will try it with the one bowl recipe some day. Where's my mind, Thanks for visiting. I think you would be pleasantly surprised. You can't really taste a strong "dried plum" flavor. Doodles, I'm with you. I love all dried fruit. I'll be patiently waiting for a great dried fig dish from you!!! Crystal, Glad I reminded you. I plan on using it all the time now!